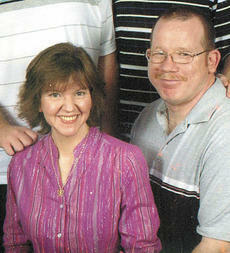 Barry and Barb Hale of Williamstown, will celebrate their 21st anniversary on March 19. The couple were married by Judge Schroeder in Covington. The Hales have two children. Their names are Chris and Kasey Hale. Barry works at Jiffy Lube. His wife, Barb, works as a housewife. Pregnancy and the arrival of a new baby is a joyous time, but it can be overwhelming. There are countless books, websites and family members offering advice; but it is nice for new and expectant mothers to have experts available to answer specific questions and ease anxiety. The fifth annual Baby Expo is the place for new and expectant mothers (and fathers) to have their questions answered and fears lessened while socializing with other parents. This year’s festivities are from 5:30 to 7:30 p.m. on April 9 at Dry Ridge Elementary School. Celebrate everything Irish at the Grant County Public Library. In honor of St. Patrick’s Day, the library is hosting a limerick contest for adults and teenagers with the winning entry being published in the Grant County News. The limerick must be about the library or a favorite activity at the library. Submissions must be turned in to the library by March 16 and include a name and phone number. Call 824-2080 for details. 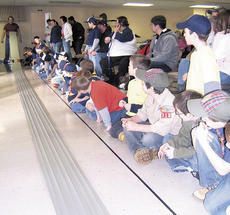 The Cub Scouts of Pack 318 held the Annual Pinewood Derby on Jan. 31 at Williamstown Baptist Church. All the scouts worked hard on their cars and were full of excitement on race day. For the first and second place winners of each den, they get to race their cars again in the district competition. First, she was crowned Grant County High School’s 2008 Homecoming queen, then she was invited to the Liberty Bowl in Memphis. Now, Felicity Spicer, a senior at GCHS, has been selected as a finalist for Kentucky’s 29th annual Homecoming Queen Selection, which will be held April 18 and April 19 at the Executive Inn West in Louisville. “It’s all been so amazing and unexpected,” said Spicer, who has a 100-watt smile that lights up a room. If the smile doesn’t garner attention, then her singing voice will. During the month of March, Curves of Crittenden and Dry Ridge will participate in the 11th Annual Curves Food Drive to benefit local food banks. Collectively, over the past five years, nearly 50 million pounds of food were distributed to local communities all over the world through the Curves Food Drive. It’s that time of year again, when the Daisies and Brownies go door to door selling their famous cookies. 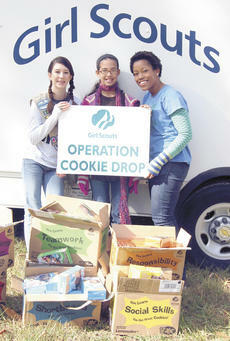 But they need more than people buying Girl Scout cookies; Grant County Girl Scouts are in need of troop leaders. Grant County currently has eight Girl Scout troops and about 100 girls on a waiting list to be in a troop. These girls cannot be the Girl Scout they want to be unless Grant County has 10 adults, 18 years or older, who want to volunteer to become troop leaders. Chris Steward had never been to Washington, D.C., so his first trip will be one he won’t soon forget. So, who out there doesn’t just love a fish fry? That great tradition is alive and well in Williamstown, where they say “we have the best fish in town.” Same great fish, same low price. St. William Church will sponsor their Lenten Fish Fry every Friday beginning Feb. 27 through April 3 from 5 to 8 p.m.
Savannah Switzer and Eldon Maddox were united in marriage on Dec. 30, 2008. The bride was given in marriage by her parents, Scott and Susan Switzer of Williamstown accompanied by the groom’s parents, Joe and Bridget Maddox of Jonesville. 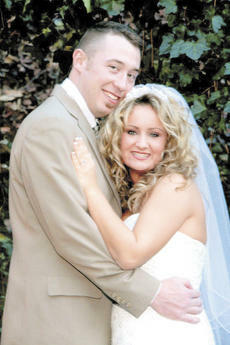 Serving as maid of honor was the bride’s best friend, Cindy Martin of Williamstown. Serving as best man was the groom’s best friend, Stanley Riley of Dry Ridge. Serving as ring bearer was the bride’s nephew, Nolan Switzer, son of Scott and Tammy Switzer of Dry Ridge.